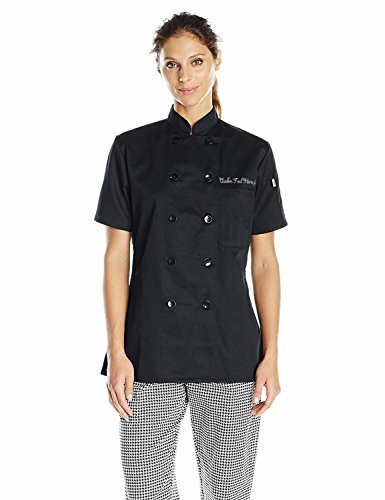 This double-breasted chef coat features 10 pearl buttons complemented by a left chest pocket with any custom text printed above the pocket. Printed in the USA by Kamal Ohava(tm). 65% polyester, 35% cotton twill. Mitered inset breast pocket, thermometer pocket, finished cuffs and collar, reinforced bar tacking, reversible closure, side vents. Women's Sizing (inches): Chest: XS = 32-33, S = 33-34, M = 34-37, L = 37-40, XL = 40-44, 2XL = 44-48, 3XL = 48-51, 4XL = 51-54, 5XL = 54-57, 6XL = 57-60. Waist: XS = 22-23, S = 23-25, M = 25-28, L = 28-31, XL = 31-35, 2XL = 35-39, 3XL = 39-43, 4XL = 43-46, 5XL = 46-49, 6XL = 49-52. Hips: XS = 32-34, S = 34-36, M = 36-39, L = 39-42, XL = 42-46, 2XL = 46-50, 3XL = 50-53, 4XL = 53-56, 5XL = 56-59, 6XL = 59-62. Due to different screen/monitor settings, colors of garment and decoration may vary slightly from how product images appear on your screen. To add your custom text, choose your size then click "Customize Now"